This is based off of vcczar’s 1864 election campaign. I got his permission to use it. This is the what-if version of that. What if Tennessee and Louisiana’s electoral votes counted? This election takes place during the Civil War. Despite the twin victories of Gettysburg and Vicksburg, Lincoln’s reelection is far from certain as the war seems far from over. Lincoln’s reelection hinges around military success. The Democrats, meanwhile, are split between Peace Democrats and War Democrats. 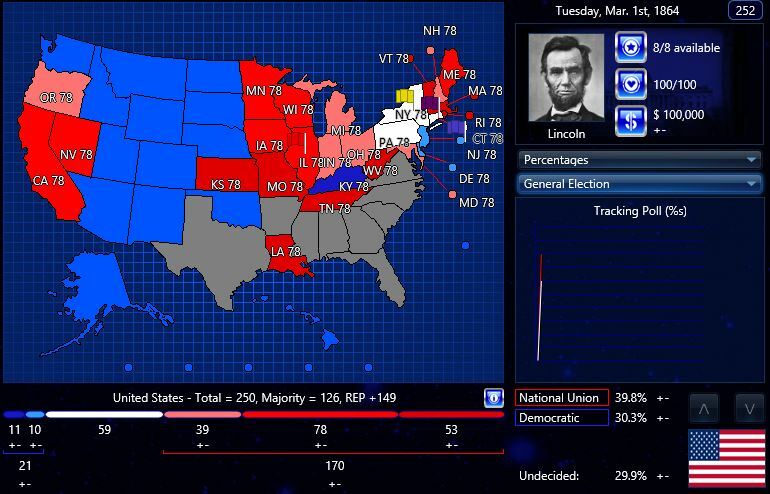 For Republicans, President Abraham Lincoln ran mostly unopposed (Grant, who was not running, would get token opposition votes from Missouri). Salmon P. Chase and Benjamin Wade considered running in the election (as they would in 1868), but ultimately backed out. For Democrats, the front runner is General George B. McClellan, who was an adversary of Lincoln, whom the president removed from campaign following a very timid military career early in the war. He was a War Democrat, favoring continuing the war, but would follow the Peace Platform if nominated. Thomas H. Seymour, a Peace Democrat, and Charles O’Conor, a Bourbon Democrat, were his strongest competitors. What if Lincoln was challenged by leading Radical Republicans Salmon P. Chase, Benjamin Wade, Charles Sumner, Simon Cameron and more? What if Radical Republicans convinced the popular Ulysses S. Grant to give up his military duties and challenge Lincoln for the presidency? Many Democrats decided not to challenge Lincoln, believing it was a lost cause. What if leading Democrats Horatio Seymour, former president Franklin Pierce, Governor Andrew Johnson, former president James Buchanan, former president Millard Fillmore and others ran anyway? Radical Republicans opposed to Lincoln’s leniency attempted to run a 3rd Party, which fell apart not too long after their convention. What if John C. Fremont or Ulysses S. Grant led the Radical Democracy Party against the two primary parties?